As we’ve seen in this league many times in recent seasons, finals are a whole new ball game. You can dominate a regular season, but that doesn’t guarantee you success when the business end of the season comes around. We saw it again on Saturday at Blacktown when runaway Minor Premiers, North Shore went down to UNSW Eastern Suburbs in the Men’s Premier Division Second Semi-Final. The Bombers had dropped just two games during the regular season, but one of them was to the Bulldogs. 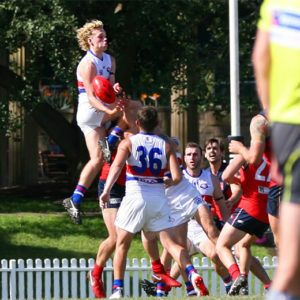 The Bulldogs wasted little time in signalling their intentions, as they burst out of the blocks with a burst of footy that netted them four goals in the first term. The Bombers were not quite as switched on as perhaps they should have been, best exemplified by a foot-fault when kicking in after a behind, which allowed unmarked Bulldog crumbers around the ball-up to snap a goal. Against the run of play the Bombers did manage two goals, but the Bulldogs were clearly the more focussed team in the first term and should perhaps have led by more than the 15-point advantage they held. Within seconds of the second quarter getting under way, the Bulldogs were on the scoreboard again, and with a 22-point lead, the scent of an upset was in the air. The Bombers knew they had to lift, and they did. But it would be a long way back, with an interchange bench that resembled a casualty ward and a determined opposition who had worked their way into the lead and was able to come up with the answering goals when they were needed in the second term. The quarter would yield a return of three goals apiece, finishing as it started with the Bulldogs 15 points ahead. Tensions were rising, spilling over into an all-in melee as the half-time siren sounded, desperate warriors flying the flag for their club’s cause. Though, the Bombers weren’t done yet. Two quick goals to start the third term, and suddenly the margin was back to two points. However, the Bombers were unable to take the lead in the third quarter. Another goal apiece, and the Bombers pressed forward time and again, piling on the pressure but being repelled by the relentless Bulldog defence. As the quarter drew into time-on, the Bulldogs got themselves a buffer as North Shore discipline let them down – two free kicks up forward and a 50-metre penalty for the second gave the Bulldogs two goals. For all North Shore’s efforts in the third term, they had only made three points up on their opponents, and still had 12 points to make up in the last. An early goal gave the Bombers a sniff. Max Thomas snapped truly and scores were level. Then Wayd Blackburne, from in front of the scoreboard, threaded the needle on the run from an impossible angle. It had taken just 12 minutes of the last quarter, but the Bombers were in front for the first time. The momentum looked to be running their way, plenty of noise coming from the grandstand. But there was another twist in the tale, as a quick snap from the Bulldogs levelled the scores. A centre break and the ball landed in the arms of Steven Pollock. Using his calm head and experience, calmly slotting the ball through and the Bulldogs were back in front. The clock was deep in time on, the Bulldogs were leading by five points. A desperate snap by Blackburne again, that would have restored North Shore’s lead, hit the post. The Bulldogs went coast-to-coast, and the lightning reflexes of Jesse Aish saw him snap truly. A result that looked unlikely just 15 minutes earlier was complete, and the Bulldogs were first into the Grand Final. The final margin was 10 points. 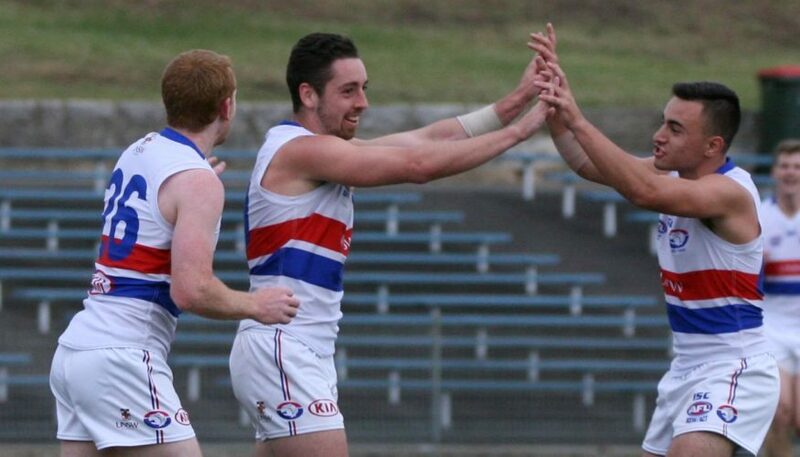 Jesse Aish, Darcy Cordell and Jack Blair had been magnificent for the Bulldogs. Two finals, two wins, and the Bulldogs have their place in Sydney footy’s big day confirmed for the first time since 2012. Getting the early break, and forcing the Bombers into playing catch-up footy for most of the day, was pivotal towards getting the job done. The Bombers were well served by the efforts of Chris Loone, Matt Wilson and Ned Campbell. But in the end, they weren’t able to get the win. 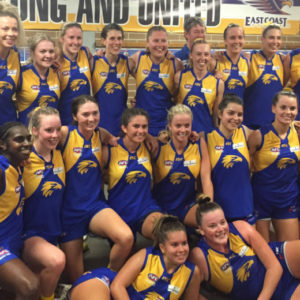 They have another chance – the advantage of being Minor Premiers – but they still have one more game that they must win to be part of their first Grand Final since 2007. North Shore’s opponents in the Preliminary Final will be Sydney University. It wasn’t a match-up that was looking likely for most of Sunday afternoon, but the Students ended up progressing after coming from nowhere to beat Manly in Sunday’s First Semi-Final at Blacktown. Manly were there after a scrappy Elimination Final win over East Coast and the Wolves looked to be maintaining that form during the early exchanges. It was a tight slog in the first quarter, bodies flying into each other with far more regularity than outside runners were able to get clean possessions. There weren’t many chances created, the ball being bottled up in frequent stoppages around the wings and the midfield. 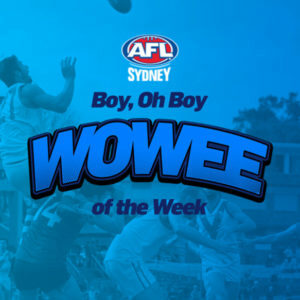 But the Wolves were able to make better use of the chances that did come, as they kicked three goals to one and led by 11 points at quarter time. After a first quarter of intense pressure, the game opened up in the second quarter, with more attacking flair and a more positive mindset being shown. Scoring still wasn’t easy, but the forwards were able to find some room to lead and create chances. The Wolves, with winning momentum behind them, were looking the stronger team, and a run of three goals to two for the quarter saw them leading by 19 points at the long break. During the third quarter, the game looked to be meandering towards an inevitable Manly win. The ball was being sucked out wide with the gravitational pull of a black hole, direct movement a near unthinkable concept. Manly kicked the only goal for the quarter, but there was little sign of urgency on display as ball-up followed ball-up and throw-in followed throw-in. A quarter that showed little to inspire concluded with the Wolves 26 points ahead. For much of the quarter the game looked to be drifting, the Students’ season appeared to be petering out. For three quarters, the Students had been flat, ground down by Manly’s pressure and seemingly unable to find any spark that would kick-start them into action. But whatever was said in their huddle at three quarter time had the desired effect. Suddenly, as the last term started, they sprung to life and found a sense of purpose and direction. Three lethargic quarters were behind them, they had drive and pace, and found their direction into the forward-50. The goals started flowing, and the deficit was quickly eroding away. For the first time all day, Manly were under pressure. The Wolves did manage one goal in the last quarter, giving them a buffer,but the Students kept coming and the margin kept dropping. The sixth goal of the quarter, with just moments to go, gave the Students the lead for the first time all day. The siren sounded, and an unlikely win had been pulled off with the Students winning by five points. Manly players slumped to the ground in disbelief. A game that had looked in their keeping all day was snatched from them in the final moments. Ryan Wearne, Anthony Robertson and Hamish Ellem had been outstanding all day for the Wolves, but this was a shock way to lose after leading all day, a shock end to what had been a positive season. Returning to the finals was a success after two years out of the playoffs – a fourth place finish is as high as they would go. Spencer and Monty Krochmal and Harry Morrison led the way for the Students, as their final quarter effort got them out of jail and kept their season alive for another week. It won’t be easy for Sydney University, against a North Shore team that will be desperate to bounce back and avoid going out in the Preliminary Final for the third year in a row. But in 12 of the last 15 seasons, the team that won the First Semi-Final has gone on to win the Preliminary Final. Winning form seems to be good momentum – Sydney University can’t be ruled out.